A gelatinous twist on a classic St. Patrick's Day drink. Think of these as "grown-up JELL-O Jigglers"! A No-Chug Chocolate Stout, Jameson and Irish Cream Cocktail! Most people who know me know that I’m pretty famous within my circle of friends for my Chocolate Stout, Jameson, and Irish Cream cupcakes. I honestly think I whipped up about 30 batches last March alone. It seems like everyone loves the taste of those three libations combined (more commonly known in pubs as an “Irish Car Bomb” – I didn’t name it that! ), but not all of us enjoy dropping a shot of liquor into a glass of stout, and quickly chugging it before the Irish Cream curdles. Not fun. But what can be even more unfortunate, is that some folks don’t chug it in time, it curdles, and it doesn’t remain in their stomachs for much longer after that. Again, not fun. Fortunately, I’m one of the few who manages to throw it back before it curdles, so I am quite fond of the drink. Now, those close to me are already well-aware that I think pretty much every drink should be in jelly shot form, or at least in a decorative gelatin mold. I have a serious, serious problem with collecting gelatin molds. It’s now at a point where I have so many, I haven’t used them all and am not even sure which molds I even own anymore. I even have a group of people who search for gelatin molds at yard sales and thrift stores for me, because they can’t believe anyone would get as excited about a decoratively-shaped piece of metal as I do. So I suppose one could say that I’m a self-proclaimed vintage gelatin mold hoarder. Anyhow! I’ve put nearly everything in jelly shot form, and with it being March and St. Patrick’s Day is just around the corner, I decided to combine my love for the two, and concocted these Chocolate Stout, Jameson, and Irish Cream Jelly Shots – an easier, less messy way to enjoy that very distinct taste with an added bonus of not having to chug the drink before it curdles. Guinness is most commonly used, but I’ve used Young’s Double Chocolate Stout to for a little extra kick of chocolate. Have I convinced you yet? 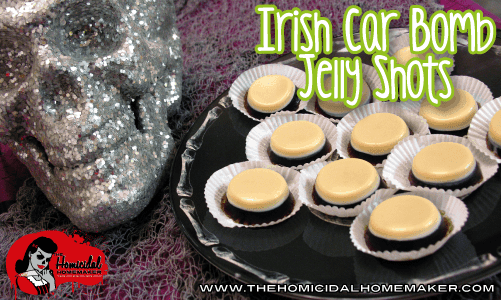 Being that these Chocolate Stout, Jameson and Irish Cream Jelly Shots are quite a bit denser than the JELL-O shots you’re probably used to, I choose to not use the cups – they’re not necessary, as the jelly shot can support itself. Think of these Chocolate Stout, Jameson, and Irish Cream Jelly Shots more as ‘grown up Jigglers’ rather than JELL-O shots! The cups can get costly, are wasteful, and tend to be a pain in the you-know-what to get the shot out of the cup. I always use inexpensive mini-cupcake wrappers or a decorative platter to serve my jelly shots. Slowly pour approximately 8 oz of Chocolate Stout into a large pot (don’t drink the remainder – you still need an additional 4 oz of it!). Refrain from wanting to use a smaller pot; you want the Chocolate Stout as spread out as much as possible. Sprinkle two packets of unflavored gelatin over the top. It is extremely important that you sprinkle the gelatin, and not dump it all in. Let it sit for two minutes (you are ‘blooming’ or softening the gelatin). Turn your stove burner on to the lowest possible setting and gently use your wire whisk to stir the mixture. Add in the sugar, and continue stirring until the gelatin and sugar are completely dissolved and there are not any visible clumps – approximately two minutes. Remove from heat, and add in the remaining 4 oz of Chocolate Stout. Stir gently, set aside, and let cool at room temperature (do not refrigerate). In a separate large pot, add 1/3 C. of Jameson Irish Whiskey and 1/3 C. of Bailey’s Irish Cream. Sprinkle one packet of unflavored gelatin over the top. Let sit for two minutes to ‘bloom’; turn stove burner to lowest possible setting and gently stir with a wire whisk for approximately two minutes, or until gelatin is dissolved. Remove from heat, and add in 1/4 C. of sweetened condensed milk. Gently stir until combined. Prepare your molds/cups by lightly spraying with non-stick cooking spray, and wiping with a paper towel. You only need a slight residue from the cooking spray to free the jelly shot. Any more than that, and you have an oily, shiny residue on the outside of your jelly shot. Fill each cavity of your mold, or cups, 1/3 of the way with your “Bomb Layer”. Refrigerate just until set, about 3-5 minutes. It’s important you do not let it refrigerate for too long, otherwise, your “Stout Layer” may not properly stick. Not refrigerated long enough, and the layers will bleed together. To test your gelatin, lightly touch with your finger; if it’s gently set but still sticks to your finger, it’s perfect. Fill remainder of the mold or cup with your “Stout Layer”, and continue to refrigerate until set. It shouldn’t take more than another 10 minutes, but a few hours would be ideal. Then unmold! If you used cups, skip this step. If you used a silicone mold, use a spoon or small spatula to pull the edges of the jelly shots away from the mold. Pop the jelly shots out one by one, and place on flattened mini-cupcake wrappers. Now serve, and enjoy! Previous articleI’m Featured in the “Have a Heart for Horror” Cookbook! Next articleEdible Entrails – A Morbid Twist on Pigs in a Blanket! love your personality and creations!